As the story goes, polar geologist Noel Potter always had a pipe on hand, within reach or in his mouth. 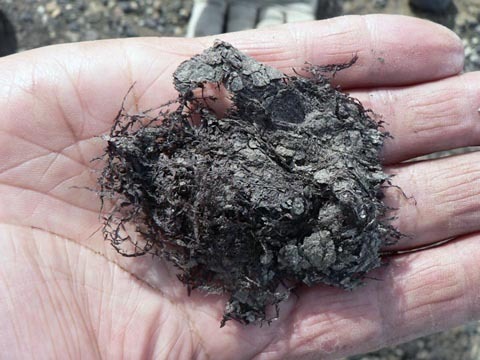 As a result, when he was looking at his soil samples from the Friis Hills in Antarctica in the mid-1980s, he couldn’t know for sure if the dried fibers he saw were from the sample or from his pipe. But he kept good notes of where he’d gotten his samples, and which of them had those puzzling fibers in them. His field notes and sketches of the glacial deposits would later help other geologists select the location for an expedition that would reshape the understanding of the climate history of the continent, and become the subject of a 2008 documentary, Ice People. 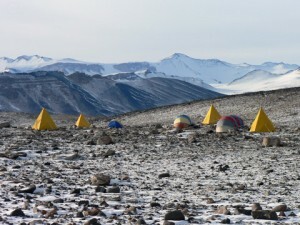 In 2000, Adam Lewis and a graduate student from Boston University, Jane Willenbring, were exploring the glacial geology of the Dry Valleys region of Antarctica. Because the region is swept by high, gusty winds, the valley floors are free of snow and ice cover. Walking on them is like walking on pavement. To find layers of sedimentary rock that could show changes in the environment, Adam and Jane looked for sites that would have been protected from the winds, which can move small rocks about. 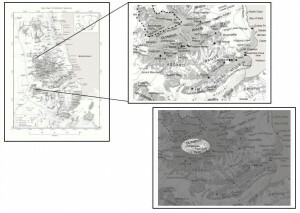 Maps showing the Dry Valleys and Olympus Range. Images courtesy of Adam Lewis. A helicopter view of the Olympus Range, Antarctica. Photo courtesy of Adam Lewis. 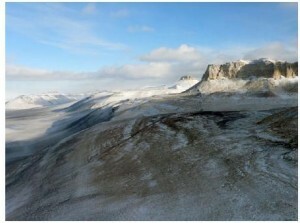 At the end of a long day in the Olympus Range near Wright Valley, the two took a walk toward Mount Boreas. They decided to check a nearby bench (a narrow flat ledge) before heading back to camp. Sure enough, they found layers of boulders (large rocks) with tills (mixed rock sizes). These rocks were clearly glacial sediments. Jane walked over to another bench into an area of powdery and light-colored sediments. She recognized the sediments as a layer of diatoms (one-celled algae) and realized that she was standing on a lakebed. But even more exciting to her were some tiny fibers sticking up out of the powder between her feet! Sifting through the powdery layers, she and Adam collected tangled masses of the fibers and hypothesized they might be mosses. They stayed a few more hours exploring and documenting the evidence, finding alternating layers of diatoms and mats of the fibers. A clump of moss from the lakebed near Mt. Boreas. Photo courtesy of Adam Lewis. Jane had found clear evidence of a lake in what is now known as the Boreas site. Clues to the conditions in any lake come from lakebed evidence such as particle sizes in the sediments, the size and direction of ripple marks, the types and amounts of organic matter in the sediments, and erosion features that mark where the shoreline had been or how the water had been impounded. While we tend to think of them as long-lasting bodies, lakes are often very temporary in terms of geologic time and therefore provide unique elements in the geologic history of a region. In this case, the evidence from the life forms in the lake offered several important clues to the conditions of the past. The glasslike shells of diatoms preserve very well and make them an important type of fossil. The thick layer of diatoms in this lakebed indicated that the lake had been clear, deep, and open, unlike the perennially ice-covered lakes of the McMurdo Dry Valleys today. Later analysis showed that the diatoms in the oldest layer were a hardy type that lived at the bottom of the lake. Diatoms from younger layers were planktonic (lived up in the water column), and would have floated rather than stayed at a certain depth. This meant that the lake water was circulating, probably stirred by the winds. In order for the winds to stir the lakes, the lake surface needed to be open to the air (unfrozen) for months at a time, or even the whole summer. The plant fibers Adam and Jane found were indeed from a moss. The species, Drepanocladus longifolius, is found today on every continent in saturated environments, such as swamps or peat bogs. The presence of layers of this moss meant that the lake had been reduced to a swamplike state for unknown periods of time…years, decades, or possibly even centuries. Maybe the lake levels dropped because there was less melting of ice or less rainfall — or both. Or, if the lakes were stream-fed, maybe the streams drained in another direction for a period of time. Whatever the reason, each layer of moss indicated that the water level was low for a period of time. The alternating layers of diatoms and mosses showed a repeated pattern in which the lake became a swamp and then flooded to become a lake again. Laminations. Photo courtesy of Adam Lewis. The fact that a rather general and common type of moss, not specialized for an extreme environment, was found in Antarctica is an indication that conditions were not so harsh at the time. Also, a variety of other organisms were found among the moss plants, offering further evidence of long ice-free periods. For example, ostracods (a crustacean, typical of moist environments) were found in all stages of their development, from larvae to adults. Larval stages of midges (an insect) were found among the mosses, along with a piece of a beetle. In creating a geologic history of a site, geologists use a rule, called the law of superposition, which states that if layers of rock and soil are undisturbed, the older layers are found at the bottom and younger layers are added on top. 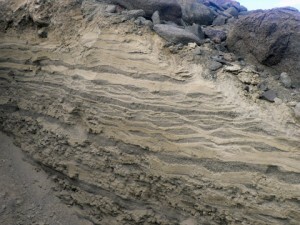 Such layers, or strata, give an idea of relative time (earlier or later than the other layers in the formation). They do not reveal how long ago the layers formed. The natural radioactivity of certain elements in rocks can be used to determine the approximate age of geologic formations. Igneous rocks and layers of volcanic ash provide useful evidence of the time frames within earth’s history. Antarctica has active and extinct volcanoes. Geologists had dated a layer of volcanic ash in a nearby lakebed with identical moss and diatom layers back to 14.07 million years ago. Under the law of superposition, the fossils Adam and Jane had discovered would be older than the ash layer above them. If so, this would mean that the fossils had been there at least 14 million years. These lakebed sediments are known as "climbing ripples." They show the direction the sediments were coming from, and how the sediments built on each other because it was such rapid accumulation. Photo courtesy of Adam Lewis. After their return to the United States, Adam and Jane invited Allan Ashworth, a paleoecologist, to look at the fossils. Paleoecologists use fossils to reconstruct the ecosystems of the past. Initially, Allan thought it was unlikely that the plant remains could withstand the strong winds in that part of Antarctica for millions of years. But geologists and paleoecologists love the challenge of a good puzzle about earth’s history. Together they planned a trip to gather more evidence. Over the next two years, Adam and his colleagues returned to the Boreas site to pursue the mystery of the lakebeds and the mosses. They gathered more samples, flew over the region by helicopter to look for new sites, and mapped the region. As they scoured the literature about others’ findings, it became obvious that they should consult Noel Potter’s work. This is the field camp at the Boreas lakebed site. Photo courtesy of Adam Lewis. Adam and his colleagues used Noel Potter’s notes to determine where he had been when those puzzling fibers had shown up in his samples. In the 2005-06 field season, Adam, Allan, and a graduate student explored the Friis Hills, where Potter had worked. Using GPS locations and photocopies of diagrams from Potter’s field notebook, they found a disturbed area where they thought he might have worked, and they began to dig a pit. Adam Lewis and Allan Ashworth in Antarctica. Photo courtesy of Adam Lewis. As the researchers dug, the wind picked up speed, blowing sand and making work uncomfortable. They decided to take a break and come back after lunch. When they came back, the wind had blown away enough soil to expose pieces of roots and stems sticking out of the wall of the pit. The pieces were small: only centimeters long and the diameter of a pencil. They weren’t the intact remains of a plant that had lived in this spot. Instead, they were fragments that had been delivered to the area…probably by a stream. 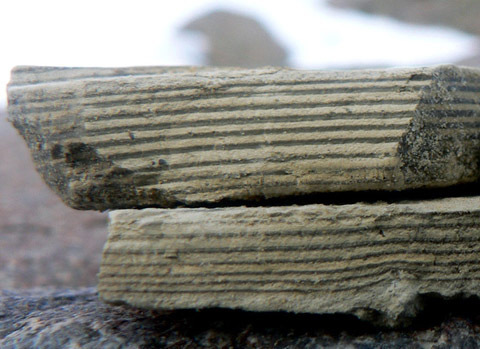 Woody pieces of plants were found in the sediments at the Friis Hills site. Photo courtesy of Adam Lewis. Once Adam and Allan recognized the plant fragments in the wall of the pit, they looked back at the pile of soil they had just dug from the pit. There were more! They just hadn’t noticed the pieces in the loose soil. They looked more closely but couldn’t determine what kind of plant they had found. Allan spent some time sifting the pile of dirt with a strainer (intended for straining noodles back at camp). He eventually found pieces of stems, twigs, and roots in the pile. Later, he examined the materials in his lab and found many pieces of insects. The researchers started to explore areas farther from camp now that they knew what to look for. Within a few days, they had found a new site at the base of a small hill where paperlike shales were exposed at the ground surface. Shales are formed from compressed mud, which is known for preserving fossils. 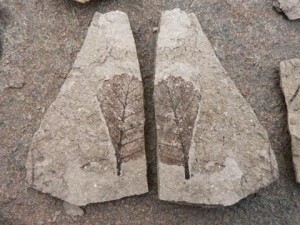 One of the rocks had split naturally, revealing a carbon print of a leaf. Carbon prints are almost like a pencil tracing; they have no depth. They are literally the carbon remains of the organism in a very thin layer. Carbon print of leaves: a "leaf pair" is visible in the layer where the rock broke. Photo courtesy of Adam Lewis. The leaves were from a type of beech tree, which clearly indicated a climate that was much warmer than the climate in Antarctica today. In a short time, Adam and Allan had collected several rocks containing leaf fossils. 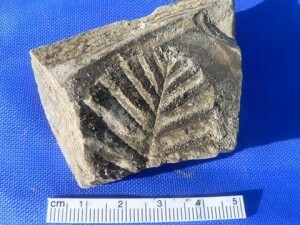 Some were prints and some were impressions, having depth and giving a different view of the leaf structure. An impression of a beech leaf. The shadows show the indentations where the texture of the leaf was preserved. Photo courtesy of Adam Lewis. The presence of woody shrubs in this part of Antarctica meant that at one time the climate had been like southern Chile’s alpine region or the tundra region of North America. Having found lakebeds with mosses more than 14 million years old in the Olympus Range, and now these woody fossils in the Friis Hills, the scientists deduced that a significant and persistent cooling had occurred. An average summer temperature around 5 degrees Celsius had fallen to the region’s current average summer temperature of about minus 12 degrees Celsius and had stayed cold enough to prohibit plant growth since then. Back in the United States, Adam and his colleagues searched the literature and reached out to other scientists who could help them assess the history of the region. Undergraduate students spent hours looking at the fossils under a microscope. One of the students, Rich Thomasson, discovered a fossilized ostracod whose internal organs were intact and visible under a scanning electron microscope. The students also discovered more than 30 types of pollen in the rock layers with the leaf fossils. A paper by Adam, Allan, Jane and other collaborators was published in the August 4, 2008, issue of Proceedings of the National Academy of Sciences (PNAS). They described the extinction of tundra in continental Antarctica around 14 million years ago when the average temperature dropped by about 8 degrees Celsius. Based on the researchers’ findings, it now appears that the Boreas lakes had at least three phases: water with hardy colonizing diatoms, low water with mosses, and deep water with planktonic diatoms. The presence of moss, ostracods and diatoms suggests open water and summer temperatures of 5 degrees Celsius, which may have been the lower limit for plant growth under those circumstances. Changes observed in the diatom species suggest that the lake existed for at least a few thousand years. Similar species progression in Arctic lakes takes from 3,000 to 5,000 years. Adam and his colleagues believe that the region went from a tundralike area with small beech trees about 20 million years ago to a cooler climate about 14 million years ago. 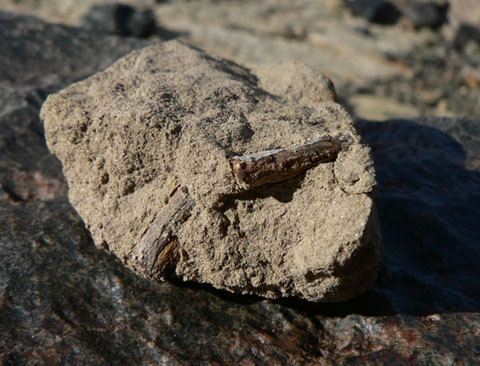 Since the lakebeds are intact and there are no younger fossils in the region, it appears that conditions have not allowed plants to grow in that region for almost 14 million years! 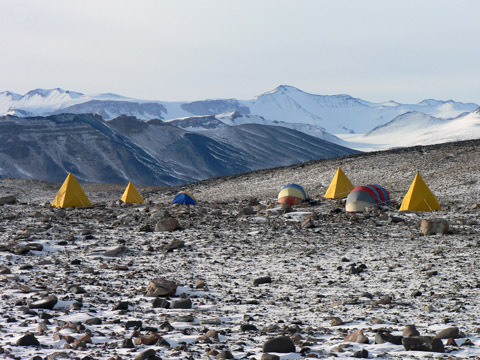 In the 2006-07 field season, Adam, Allan and two students returned to Antarctica to continue their search for clues to the geologic history of the McMurdo Dry Valleys region. This time, a film crew, supported by the Artists and Writers Program of the National Science Foundation, lived in nearby tents and recorded the researchers’ daily activities. The full-length documentary movie, Ice People, is about conducting research in Antarctica. 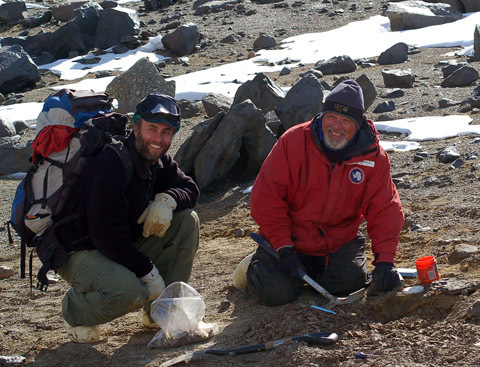 Adam and his colleagues continue to examine their samples, hoping to find evidence of small mammals living in Antarctica millions of years ago. None have been found yet, but marsupial mice (shrewlike creatures) were widespread when the continents of South America, Australia, Africa, and Antarctica were one landmass, called Gondwana. They may also wonder whose notes might now contain a clue. This article was written by Carol Landis. For more information, see the Contributors page. Email Carol at beyondpenguins@msteacher.org.